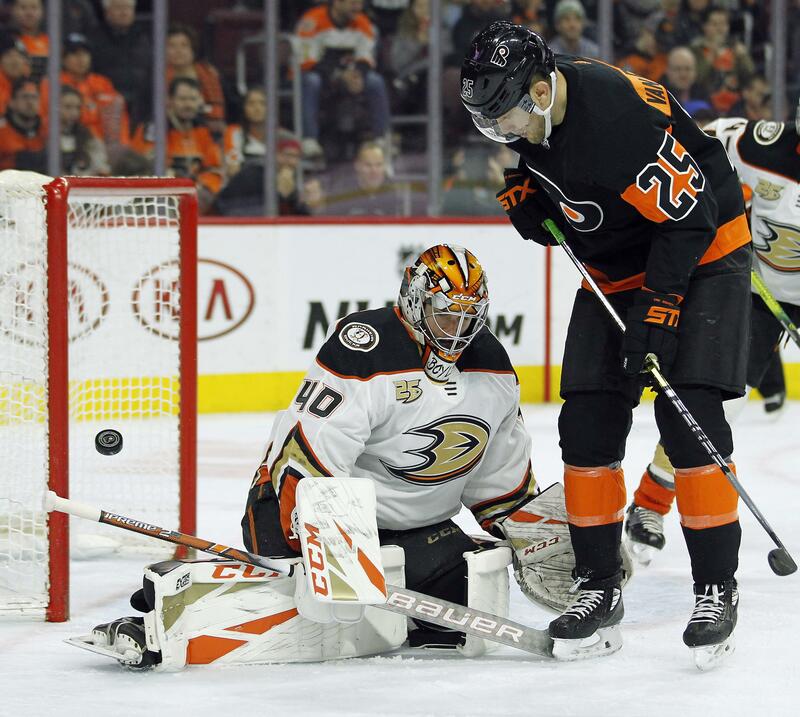 PHILADELPHIA – Carter Hart made 30 saves for his eighth straight victory, Sean Couturier had a goal and two assists and the Philadelphia Flyers scored four times in the first period to rout the slumping Anaheim Ducks 6-2 on Saturday. Michael Raffl, Oskar Lindblom, Phil Varone, Nolan Patrick and Travis Konecny also scored for the Flyers. They have won nine of 10. Adam Henrique and Nick Ritchie scored for Anaheim. The Ducks have lost seven in a row and 19 in the last 21 while ending a forgettable six-game trip. TAMPA, Fla. – Tyler Johnson and J.T Miller had third-period goals and Tampa Bay beat Pittsburgh to end a two-game skid. Yanni Gourde, Erik Cernak and Anthony Cirelli also scored for the NHL-leading Lightning. They reached 40 wins for the sixth consecutive season. Tanner Pearson, Garrett Wilson, Jared McCann and Bryan Rust scored for Pittsburgh. Sidney Crosby played in his 916th game, moving past Mario Lemieux for the most in Penguins history. EDMONTON, Alberta – Kevin Labanc had his first career hat trick and San Jose beat Edmonton for its fifth straight victory. Evander Kane and Tomas Hertl also scored, and Aaron Dell made 21 saves. Ryan Nugent-Hopkins and Zack Kassian scored for the Oilers. They have lost seven of eight. WASHINGTON – Mike Hoffman on a power play in overtime and Roberto Luongo made 26 saves to help Florida beat Washington. With Brett Connolly in the penalty box for slashing late in regulation, Hoffman scored 1:31 into overtime. Florida has the NHL’s top power play since Nov. 1. Derrick Brassard scored his second goal in four games since Florida acquired him in a deal with Pittsburgh on Feb. 1. Frank Vatrano, Keith Yandle and Colton Sceviour also scored. Connolly scored twice and Lars Eller and Evgeny Kuznetsov each had a goal for Washington. NEW YORK – Ryan Pulock scored his second goal of the game 2:23 into overtime to lift New York past Colorado. Jordan Eberle had a goal and an assist, Josh Bailey also scored, and Robin Lehner stopped 25 shots. The Islanders are 8-1-2 in their last 11 games. Carl Soderberg had a goal and two assists, Erik Johnson had a goal and an assist, and J.T Compher also scored for Colorado. The Avalanche have lost six straight. ST. LOUIS – Vladimir Tarasenko scored his 19th goal, rookie Jordan Binnington made 28 saves and St. Louis beat Nashville for its fifth straight victory. Vince Dunn and Mackenzie MacEachern also scored. Mattias Ekholm and Ryan Johansen scored for Nashville. The teams will meet again Sunday in Nashville. MONTREAL – John Tavares scored at 2:17 of overtime to lift Toronto past Montreal. Andreas Johnsson, Nikita Zaitsev and William Nylander also scored to help the Maple Leafs extend their winning streak to four games. Frederik Andersen stopped 35 shots. Andrew Shaw, Tomas Tatar and Brendan Gallagher scored for the Canadiens. Carey Price made 28 saves and lost for the first time since Jan. 10. NEWARK, N.J. – Former Devils star Zach Parise scored the go-ahead goal and Minnesota beat New Jersey to snap a four-game losing streak. Linemates Marcus Foligno, Joel Eriksson Ek and Luke Kunin also scored, and Devan Dubnyk made 16 saves. Brett Seney and Jesper Bratt scored for the Devils. BOSTON – Patrice Bergeron scored a power-play goal at 2:34 of overtime to lift Boston past Los Angeles. Brad Marchand, David Krejci and Danton Heinen scored in a 3:22 span early in the third period to give the Bruins a 4-2 edge. The Kings rallied to tie it on goals by Nate Thomson and Oscar Fantenberg. Charlie McAvoy added a goal for Boston. Alex Iafallo and Anze Kopitar also scored for the Kings. GLENDALE, Ariz. – Alex Galchenyuk scored twice and assisted on Alex Goligoski’s goal, and Darcy Kuemper stopped 33 shots to help Arizona beat Dallas. The Coyotes ended a five-game losing streak, and a nine-game slid against the Stars. Brett Ritchie and Alexander Radulov scored late goals for Dallas. OTTAWA, Ontario – Winnipeg native Mark Stone scored twice to help Ottawa beat the Jets. Matt Duchene, Ryan Dzingel and Zack Smith also scored, and Anders Nilsson made 44 saves. Bryan Little and Josh Morrissey scored for Winnipeg. The Jets have lost three straight for the first time this season. BUFFALO, N.Y. – Casey Mittelstadt and Kyle Okposo scored power-play goals and Buffalo. Conor Sheary also scored, and Linus Ullmark stopped 28 shots. Dylan Larkin scored for Detroit. LAS VEGAS – Cam Atkinson scored two goals less than three minutes apart to lead Columbus past Vegas. Nate Schmidt, Jon Merrill and Cody Eakin scored for Vegas, while Marc-Andre Fleury made 29 saves. VANCOUVER, British Columbia – Elias Pettersson scored the shootout winner, lifting Vancouver over Calgary. Canucks goalie Jacob Markstrom stopped 44 of 47 shots and had three more saves in the shootout. Bo Horvat, Josh Leivo and Brock Boeser scored for Vancouver in regulation. The victory snapped a three-game losing skid for the Canucks. Elias Lindholm, Sam Bennett and Andrew Mangiapane scored for Calgary, which lost its second straight for the first time since Dec. 22. David Rittich had 22 saves and made two stops in the shootout. Published: Feb. 10, 2019, 12:13 a.m. Updated: Feb. 10, 2019, 12:17 a.m.